Garlic mustard is native to Europe and Asia and was introduced to North America in the 1960s as a medicinal and culinary herb. 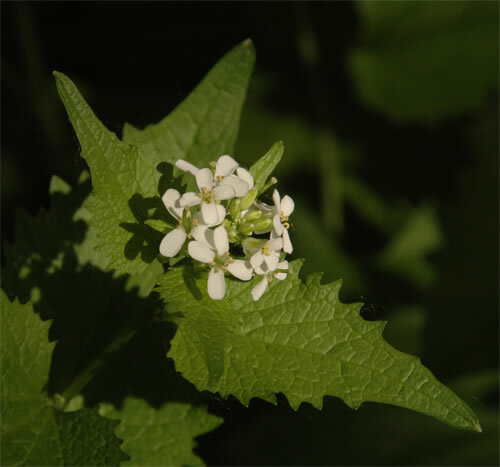 Garlic mustard releases chemicals into the surrounding soil which can inhibit the optimal growth of native plants. It out-competes native understory species in forests which can lead to an overall loss of biodiversity. Each of the white flowers has four petals and is 5-10 mm wide. The young leaves are dark in colour and range from heart to kidney-shaped. Mature leaves are characteristically heart-shaped, have toothed edges and are alternately arranged along the stem. As the species name suggests, the leaves omit a garlicky odour when crushed. This plant grows in moist woody areas and can reach up to 1.5 m tall.